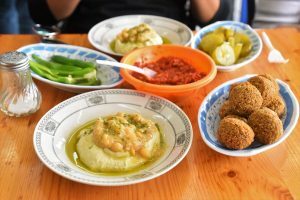 Before I went to Sri Lanka, I did a little research to find out how difficult it was going to be with vegan food there. As you might know, thanks to veganism I’ve managed to get rid of many health problems since 2013 so I am sticking to this lifestyle even on the road. 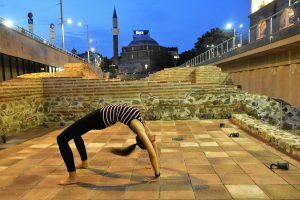 So you might ask… vegan Sri Lanka… is it possible? 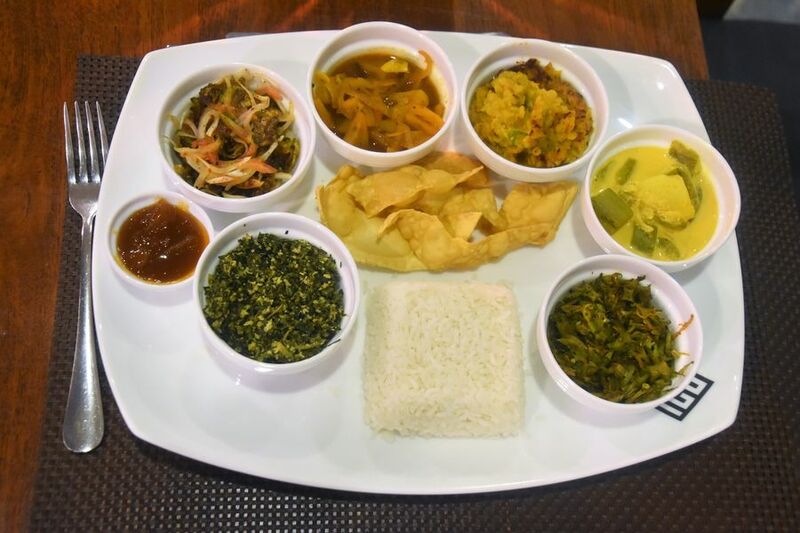 Traditional Sri Lankan cuisine is very spicy. They use a lot of chilli, black pepper, onion, garlic in almost all the salty meals. If you don’t like any of the ingredients, you need to tell them ahead of time. If they have to prepare a meal from scratch, they might use less of these ingredients or not use them at all. But even if you ask for a ”non-spicy” meal, usually it will be spicy anyway. Their understanding of spicy is different to ours. Tempered means: a lot of spices are used during the meal preparation whcih brings up their flavor even more. It’s a cooking technique when spices are roasted in oil or without oil to enhance their flavor. Basically it means that the meal will be even spicier. Bring on the dragon breath haha. Deviled means: not really sure if the word has anything to do with devil but maybe the strong flavor. It’s usually something cut into pieces, that is or fried or grilled and with a sauce. I also found it spicy just made in a slighly different way than with tempering. Always explain the word vegan. Sometimes they might not realize that ghee, eggs or butter are NOT vegan. Many people still confuse vegetarian with vegan so it’s good to clarify. 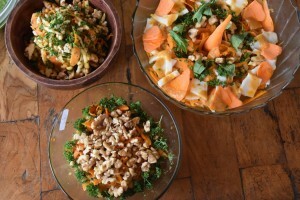 It takes quite a long time to prepare meals in Sri Lanka. In some restaurants it can be even one hour or an hour and a half, depending on the meal, so it’s normal to order a meal, leave and then go back to the restaurant to eat it or take it away. Similarly to India, Sri Lankans usually eat their meals with hands so they can connect with the food better. You can ask for cutlery, though in most places, no problem. I mention young coconuts like the first ones on this list because I believe that they are super healthy. Most probably one of the healthiest things out there in the world, together with green leafy veggies full of chlorophyll. It’s almost impossible for bacterias or any other ”negative” things to get inside a coconut. The water is filtered over and over again which makes it so healthy. Coconut water is hydrating, full of electrolytes, good source of magnesium, low in calories and contains almost no fat. If I had to choose just 1 thing to eat/drink for the rest of my life, it would be young coconut water and coconut flesh. In Sri Lanka you will find coconuts being sold along the main roads, at fruit and veggie markets, outside of fruit stalls… quite a lot all around. Get ready for orange-colored coconuts, and not the green ones as you might have seen in other countries. In Sri Lanka the orange coconuts are called ”king coconuts”. 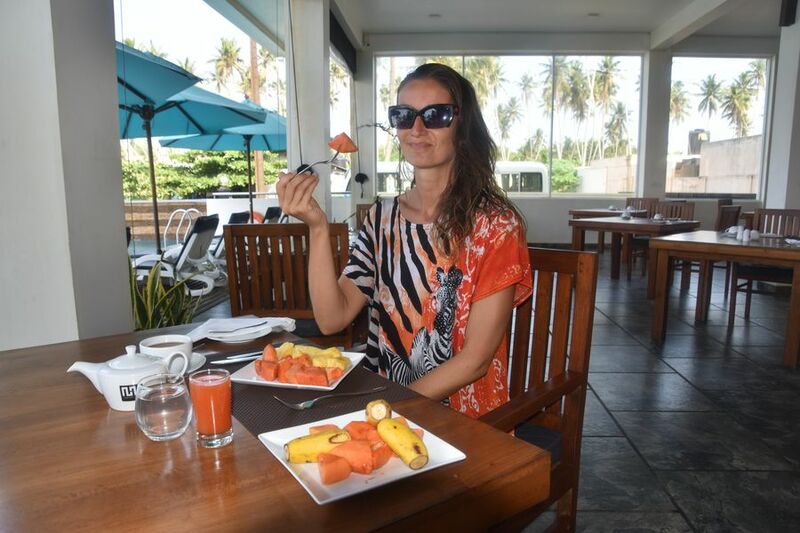 Visiting a tropical country and not tasting its exotic fruit would be a shame. 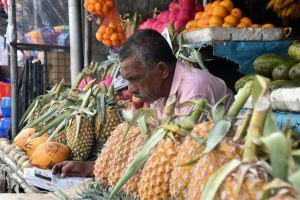 Sri Lanka is a country which offers to its visitors and locals loads of exotic fruit, such as wood apple, rambutan, pineapple, papaya, mangosteen, jack fruit, avocado, mango, guava, longan etc. 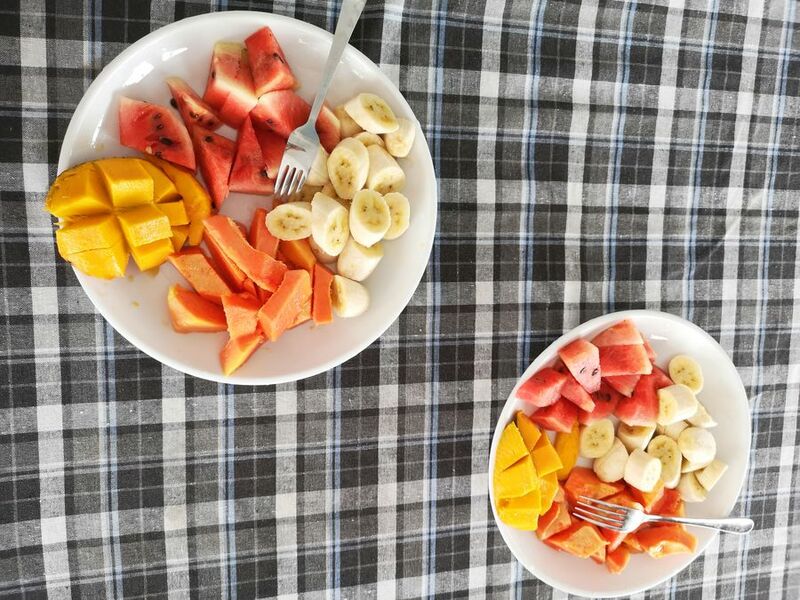 Fresh fruit that is locally grown there and picked up from trees once ripe always contains the most nutrients compared to something imported when not being ripe yet. Don’t be scared to go to a fruit stall or a fruit market and simply taste different kinds of fruit. You might fall in love with unfamiliar flavors. 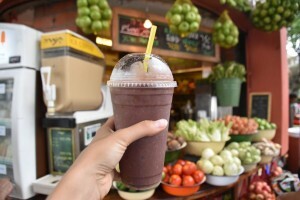 Talking of fruit, fruit smoothies/juices are also quite popular in Sri Lanka. Try to opt for those made of fruit and water only (without milk and added sugar). 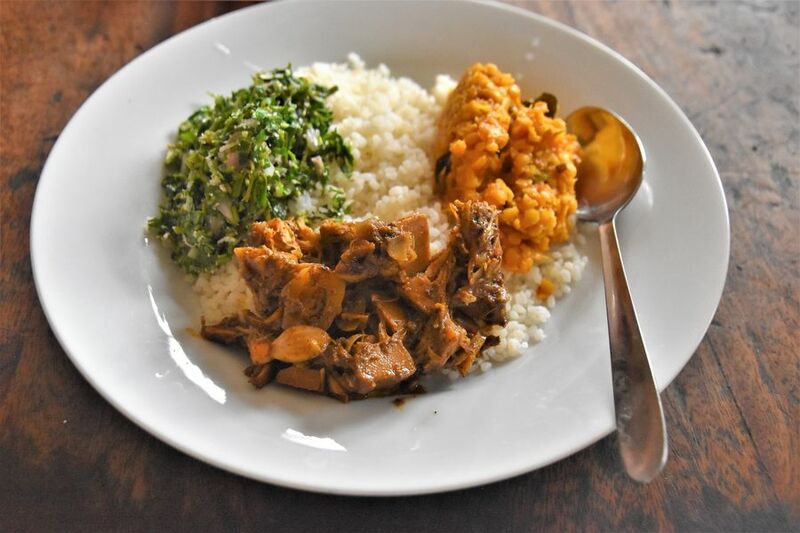 Traditional Sri Lankan rice and curry is made with coconut milk. However, there might be parts of it that would be just vegetarian (contain animal milk or eggs) and not vegan, so always double check when ordering. Just remember that Sri Lankan curry is very spicy so if you cannot handle spicy, tell them ahead of time. String hoppers or hoppers are made of rice flour (white or red) and are gluten-free. 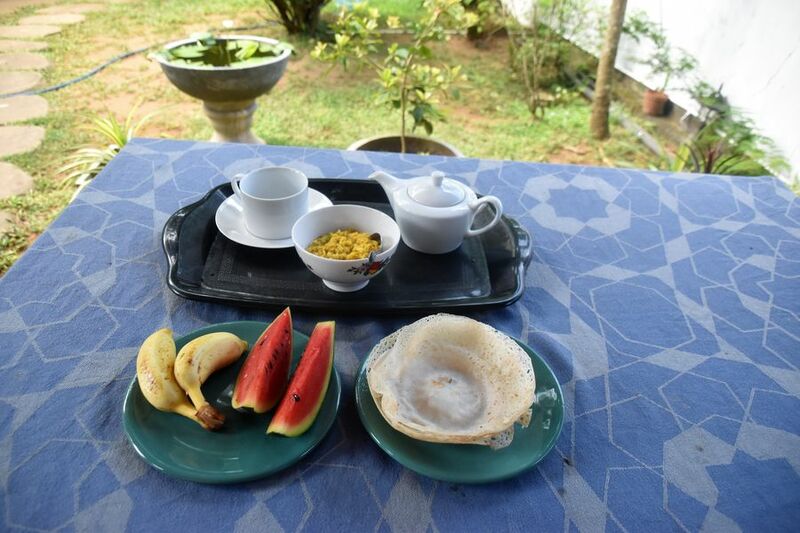 They are one of the traditional meals in Sri Lanka, mostly eaten for breakfast. Their taste is simple and it reminds me of glass noodles or rice noodles which I like to eat with veggies when in Asia. It’s even possible to buy flour for hoppers as a souvenir and then make them at home. 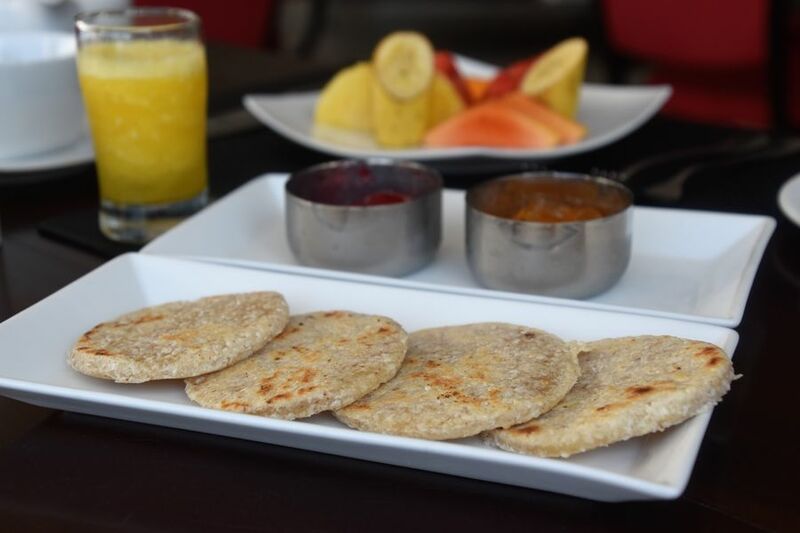 Original Sri Lankan coconut roti does not contain any animal products but it does contain gluten. 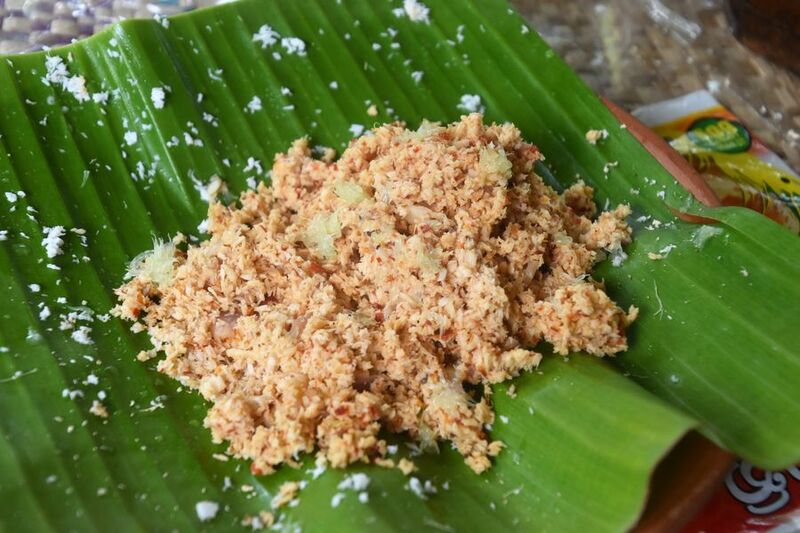 The traditional recipe says it’s just wheat or maida flour (white flour), water, grated coconut and salt. 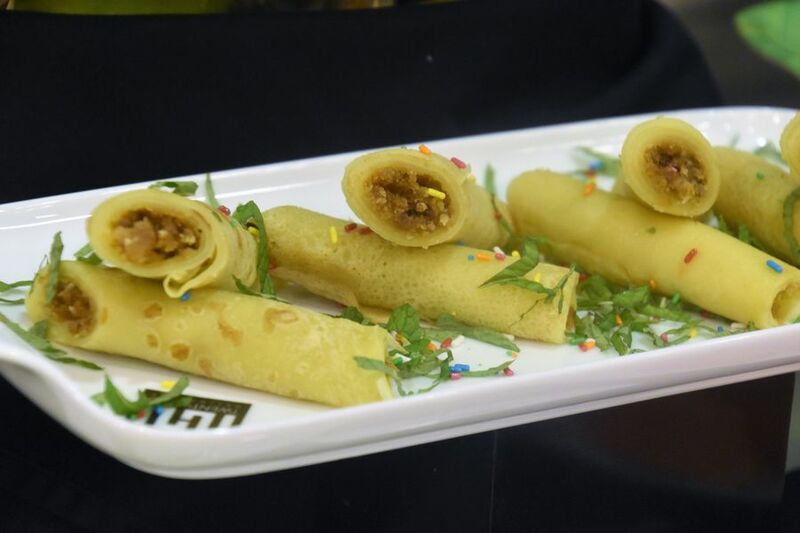 Usually roti is eaten with salty meals even though I’d prefer it with something sweet, such as banana and chocolate, or jam. But yes, I have a sweet tooth, not a salty one. Another kind of roti is vegetable roti but with this one you have to double check if they did not add eggs into the dough as in some places they do, unfortunately. They try to make it a bit special so I’ve seen it for example with leek, onion and spices. 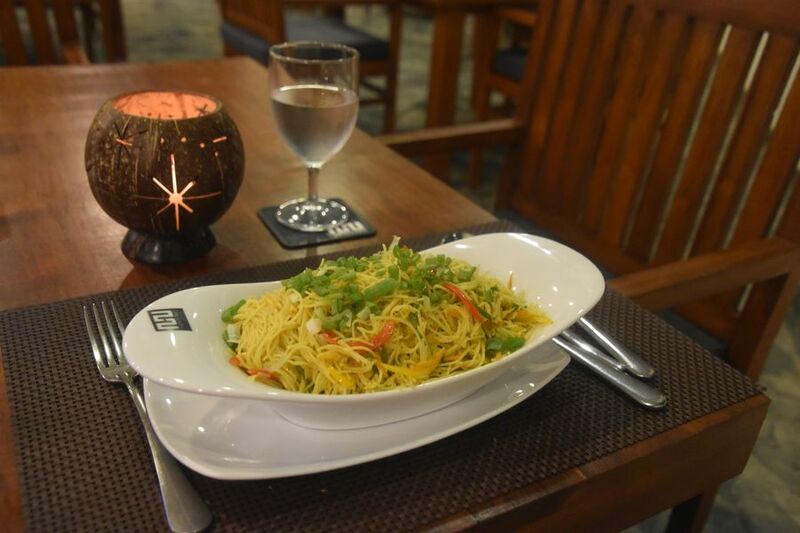 Fried vegetable noodles are quite easy to find even at smaller local restaurants, and also at many hotels. I like noodles as usually they make gluten-free noodles (not everywhere, though). I just wish they contained at least 50% veggies and 50% noodles. Unfortunately, in most places it’s 95% noodles and 5% veggies. Plus it’s always the same veggies and the meal gets boring and sometimes too dry. At least that was my experience. Fried veggie rice is easy to get as well, similarly to fried veggie noodles I mentioned above. However, I saw the same ”problem” there as with noodles. The biggest part of the meal is rice, while the vegetables form a tiny portion. Then the whole meal does not contain many nutrients and again, it tastes boring after a while. We all know that dhal is a curry made of red lentils. While in India it can be made with cow milk (vegetarian) or coconut milk (e.g. in Kerala state), in Sri Lanka I have only seen it cooked in coconut milk (vegan). Thumbs up! It’s quite quick to prepare and it’s usually eaten or with roti or with plain white rice. 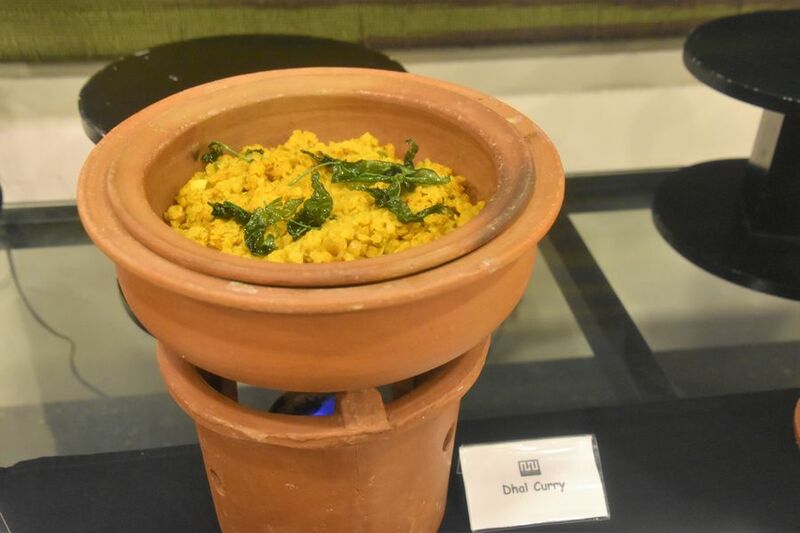 What I found interesting is that in Sri Lanka each time I tasted dhal, it was rather spicy. A bit or very spicy, but always spicy. While in India it was one of those safe meals for me and usually not spicy at all. I guess it depends on herbs used and if the cook uses a lot of chilli, onion or garlic, right? Dhal is one of those meals you cannot get enough of. At least for me. I believe this list would not be complete without dhal. Do you also love it as much as I do? Coconut sambal or sambol is a very spicy side dish made of fresh grated coconut stirred with onion, chilli powder and fresh lime or lemon juice. The more juice you add, the less spicy it will be. Personally, it was always too spicy for me so I usually avoided it after the first two or three servings. 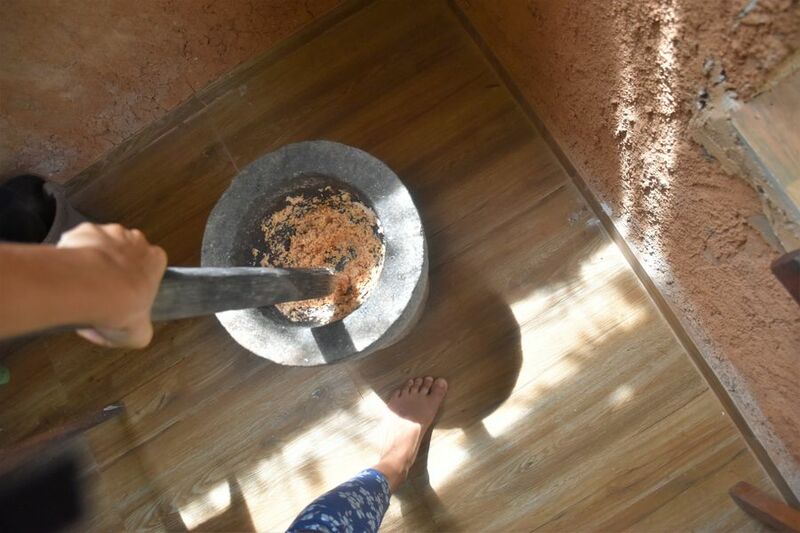 When I did a cooking class booked via 22 Weligambay, we made coconut sambal there from scratch. 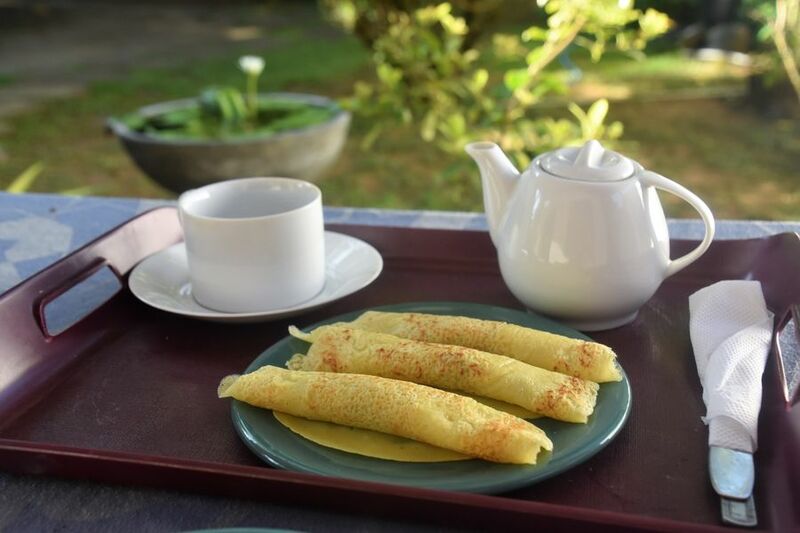 I was both really surprised and happy to find out that they do make vegan pancakes in many places around Sri Lanka. They look yellow and taste like coconut because they are mostly made of coconut milk and grated coconut. Sometimes coconut or kithul palm sugar or syrup are put inside, other times they are eaten with fresh fruit. And what about vegan snacks? 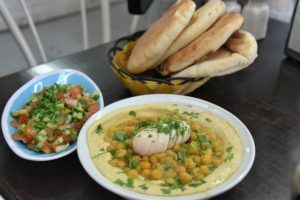 boiled chickpeas – I’ve seen a few street stalls where they sold boiled chickpeas with grated coconut, and spices if you wish. I didn’t add spices but chickpeas tasted great and it was another source of protein and fiber. 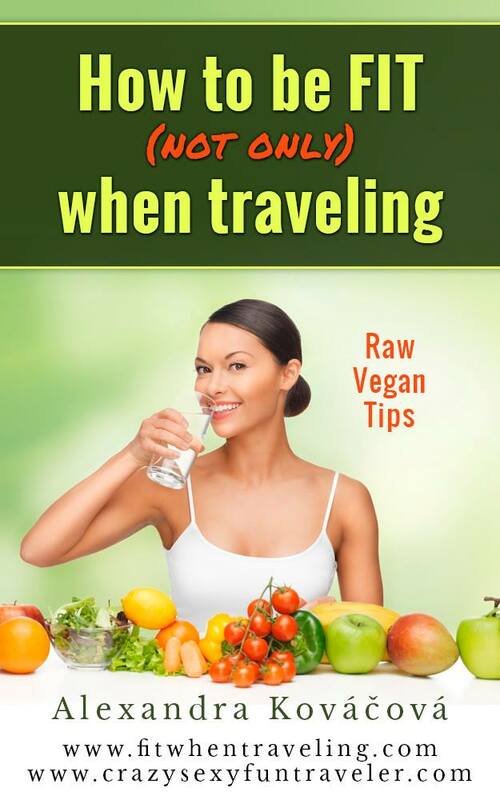 TIP: If you’d like to know more about vegan diet, I’ve written an ebook with 140 pages about it. 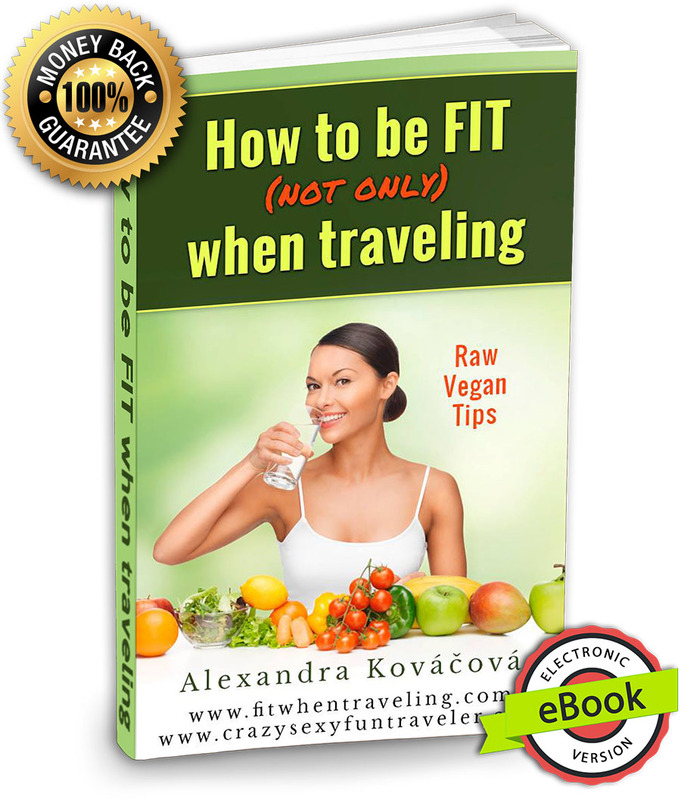 It includes also other tips on How to be fit not only when traveling. Check it out 😉 I have one version of the ebook in English, and a similar one but a bit shorter in my mother tongue Slovak. 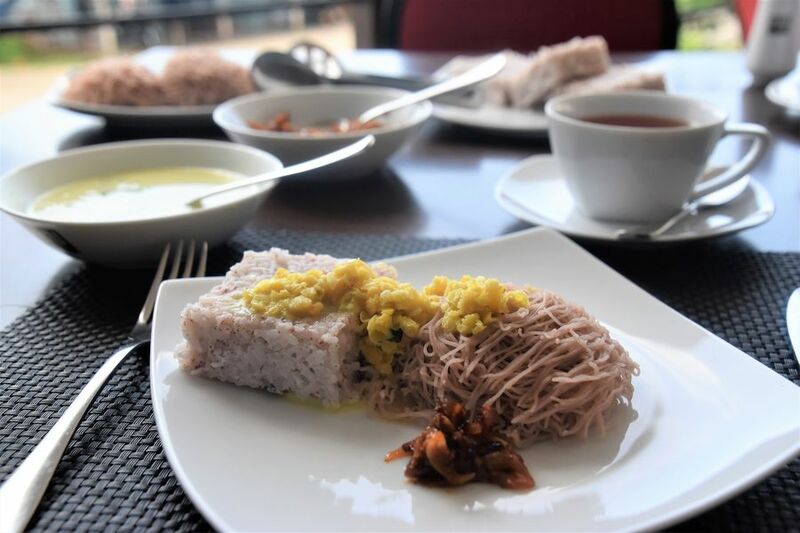 TIP 2: If you are looking for a hotel in Sri Lanka where you can be sure you will be able to get vegan meals, try 22 Weligambay. They were super nice in adjusting thier menu an buffet meals to my vegan diet once I advised them about it. Hi, Alex! I’m only a mild food lover and not exactly a fan of spicy food either. 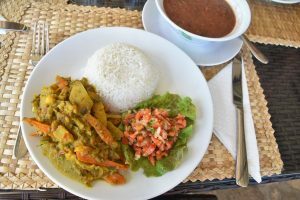 However, I do think that the food in Sri Lanka has a very unique flavor that isn’t too similar with Indian food as a lot of people say. Of course Sri Lankan food is unique but out of all the cuisines I’ve ever tried, it’s the closest to Indian 🙂 But it’s true I’m comparing vegan food specifically, and in Southern Sri Lanka vs Southern India which arre the parts of both countries I’ve been to so far 🙂 It might be different in the rest of the countries. if you rate how spicy their food is, how will you rate it? I have a Sri Lankan friend before and he got me their Tea and I so love it, haven’t had it for a long time. What I like about the food that it smells so good and it tastes more of species. This is a good read. Thanks for your comment 🙂 True, Sri Lankan tea is very good 🙂 To be honest I never tried very spicy meals as I can handle just a little spicy so I always asked for litle spicy.